Before I graduated occupational therapy school, I was given advice about looking for a first job. Settle Or Get Your Foot In the Door? 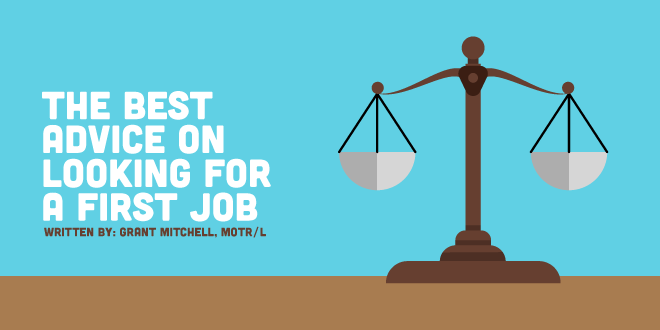 One job I applied for left me feeling uneasy and a fellow classmate explained, “you don’t have to work there forever.” While that advice didn’t encourage me to take the job I didn’t want, it did help to broaden my perspective. I’m sure I share this feeling with others; whatever job is first picked is not the one you are stuck with until retirement. Fear not, if you made it through occupational therapy graduate school, it’s usually not too hard to make it a few years through a mediocre job getting paid. During graduate school, I read about the growing demand for OT and the positive job outlook. Yet, upon graduation, the sudden pressure of passing the NBCOT, deciding on applying for a temporary permit or regular license, in what state, and also where to work, is overwhelming. Even deciding which order to complete those tasks in is confusing. The demand for OT is high. Some settings more than others. However, as one of my professors helped me realize through graduate school, professional work isn’t necessarily about taking whatever you can get. It is more about finding a match for your skills and desires. The answer to which is the right approach, is what one of my Level II Fieldwork advisors would respond with every time I sought answers; “it depends... what do you think?” That response was infuriating, but it was exactly what I needed to hear. That is why it is important to know your values. In my coursework, we spent a day going over what we valued in a job. It might be pay, job security, being a positive impact, promotion, experience, and so forth. Two important values for me were to learn and advance. The implications of my values are that a larger organization with a strong continuing education budget, multiple departments, and management opportunity is what I looked for. Did I settle for a first job? Let me put it this way, I got a job in the exact organization and department I wanted, so I didn’t settle. However, I was unable to get a full-time position meaning I chose to get my foot in the door instead of look for a full-time position elsewhere. That may seem like a simple solution, and it may not solve all the complexities of beginning your career. However, navigating the first job experience can cloud your vision and distract you from what you want. Especially because of the demand for OT, not all employers have your best interest in mind and you may be feeling the sudden desperation for a paycheck. I am certain persisting through a demanding job becomes considerably more bearable if it meets your needs and values. After all, what got you through graduate school?